What is fiber? Fiber is a form of carbohydrate which is found in plant foods such as fruit, vegetables, whole grains, beans, nuts and seeds. It is the indigestible pulp of fruit, the bran of grains and the cell walls of vegetables. During the juicing process, vegetable or fruit fiber is removed. Fiber content is significantly reduced when peeling produce and refining grains. Fiber helps us to bulk up our stools to maintain bowel regularity and lowers blood cholesterol. While all fiber improves the intestine function, not all fiber is the same. Fiber in wheat bran has very little effect on cholesterol, when compared to pectin, a fiber in apples, cherries and carrots, which eliminates cholesterol from the digestive tract. The fiber in oats also has this ability. There two types of dietary fiber, soluble and insoluble. The majority of foods, contain both of these types of fiber. Soluble fiber (prebiotic, viscous), as you can guess from the name, dissolves in water becoming a gelatinous substance that encourages the growth of healthy bacteria in the colon, which boosts the nutrient absorption and the formation of cancer resistant bowel acids. Foods high in soluble fiber: oats, dried beans, apples, citrus fruit, potatoes. Insoluble fiber (cannot be dissolved in water) has the ability to absorb water, expanding in volume and helps pass food through the intestinal tract by making our stools soft and bulky. Foods high in insoluble fiber include whole grains, wheat bran, cereals, seeds and vegetables and the edible skin of fruits. 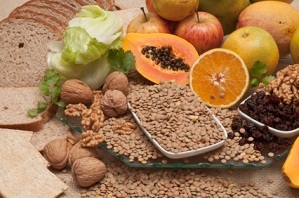 Here is the list of insoluble and soluble fiber rich foods. See our high fiber food chart to find out the sources of dietary fiber. If you want to lose weight, eat foods rich in fiber. Fiber can prevent overeating, as it takes longer to chew fibrous foods, so our brain has enough time to receive a signal that we are full and can stop eating sooner. Dietary fiber bulks up when water is absorbed, staying in the stomach longer than other foods that we eat. It slows down the digestion and absorption rate, so glucose (sugar) enters the bloodstream slowly and steadily, keeping the blood sugar levels even and us satisfied for a longer period of time. It has been proven in The Volumetrics Eating Plan by Barbara Rolls that we eat the same volume of food each day. So, if you choose foods high in fiber and water such as high fiber fruits and vegetables, salads, and vegetable soups, you will eat the same weight of food with fewer calories and feel less hungry. In one study, two groups of people were analysed. The group of people who regularly eat high fiber cereals for breakfast and overall eat more carbs and more fiber, generally weighed less than those who eat less fiber, carbs and cereals. The build-up of cholesterol plaque in coronary arteries that feed the heart is the main cause of atherosclerosis (the narrowing of arteries results in reduced blood flow and increased blood pressure), which can lead to a heart attack (complete blockage of arteries by the cholesterol plaque). Soluble fiber, which can be found in oat bran, oatmeal, beans, peas, barley, citrus fruits, apple pulp, strawberries, and other sources, is particularly beneficial for reducing cholesterol levels when regularly eaten as a part of a diet low in saturated, trans fat and cholesterol. Studies have shown that cholesterol levels reduced between 0.5 and 2% for every gram of soluble fiber consumed per day. When soluble fiber passes though the intestine it has the ability to bind to dietary cholesterol and remove it from the body. This lowers the cholesterol levels, due to the reduction of cholesterol deposits on our arterial walls. Also, soluble fiber slows down the production of cholesterol by the liver and effects LDL particles by making them larger and less dense. It’s believed that smaller and denser LDL particles hold a health threat. A large long term study found that a group of people with a high intake of dietary fiber had a lower risk of coronary heart disease by 40%, when compared to a group with a low fiber intake. Also, people who ate at least 2.5 portions of whole grain foods per day were found to be 21% less likely to suffer from cardiovascular disease when compared to those who ate less than 2 whole grain portions a week. A high intake of cereal fiber and whole grains may prevent the occurrence of this common disease. Soluble fiber can prevent blood glucose fluctuation throughout the day, as it captures carbohydrates in the same way as with cholesterol, to slow the absorption into the blood stream. There are a lot of aspects which might contribute to the risk of developing type 2 (non-insulin dependent) diabetes including obesity, lack of exercise, smoking and low fiber or a no fiber diet. Numerous studies have shown that a “cereal fiber” rich diet was linked to a decreased risk of this disease. A cereal fiber is the kind of fiber you would expect to find in a box of high fiber cereals, also found in bran, brown rice, whole wheat pasta and bread, barley, seeds and other whole grains. On the contrary, a diet low in “cereal fiber” and rich in high glycemic index foods (french fries, sugary drinks, white bread and rice - foods that cause big swings in blood sugar levels), was found to double the risk of developing type 2 diabetes, when compared to low glycemic and high fiber diets. Please note that, dietary fiber from fruit and vegetables do not have the same effect as fiber from grains. Another large study with 700,000 participants found that the consumption of 2 extra portions of whole grain foods a day reduced the risk of type 2 diabetes by 21%. Fiber prevents constipation. Insoluble fiber bulks up the stool and speeds up the passage of faecal material though the intestine, preventing or helping to relieve constipation. It is thought that a high fiber diet may help to prevent diverticulosis, a condition where the lining of the colon or large intestine bulges outwards through weak spots from the pressure of stretching during bowel movements. People with diverticulosis found that boosting their fiber intake can relieve the symptoms. What Are The Best Fiber Supplements? Be cautious of using fiber supplements for weight loss. The U.S. Food and Drug Administration banned methycellulose together with 110 other ingredients in fiber weight loss supplements, as there was no evidence that they were effective and safe. Products containing guar gum were reported to cause gastric or esophageal obstruction. Fiber from bamboo and cotton seeds are labelled as “vegetable fiber” on packaged products and can be often found in shredded cheese, pretzels, pasta, breakfast cereals and other foods. Unfortunately, these cheap industrial by-products are often contaminated with chemical residues not allowed on food products. New research suggests that we need 35 grams of fiber a day to help to lower the risk of chronic diseases. Fiber supplements can compensate the lack of fiber, but should not be substituted for fiber rich foods, as they provide different types of dietary fiber and contain nutrients which may prevent chronic diseases. However, if you still insist on taking supplements, after all, we live very busy lives, then we suggest natural fiber sources such as psyllium seed husks. So, how much fiber should we eat to realise its potential benefits? The majority of people eat only 11 grams of fiber a day. The table below is presented by the USDA and shows what Adequate Intake (Al) of fiber should be in the different stages of our life. The USDA food pyramid recommends to have 2-4 servings of fruit, 3-5 servings of vegetables and 6-11 servings of grain and cereal foods to get the required 25- 30 grams of fiber a day. 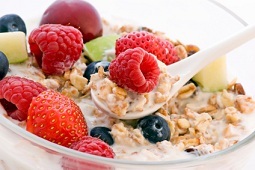 Have a high fiber cereal for breakfast: whole grain cereal should contain at least 5 grams of fiber per serving. You can also add raisins, berries, bananas and wheat germ; they are all good sources of fiber. Avoid peeling and juicing fruits and vegetables. 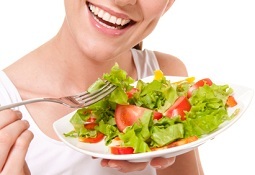 Eat raw vegetables; cooking can reduce the dietary fiber content. Fresh and dried fruit are excellent healthy snacks. Include more beans into your diet in soups, salads and stews to boost fiber intake. Eat more foods with unprocessed grains such as couscous, bulgur, whole grain bread, pasta and cereals. 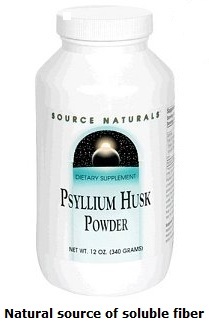 Or as a supplement consider the unrefined husks of psyllium seeds.